The title sounds much raunchier than this blog post actually is! 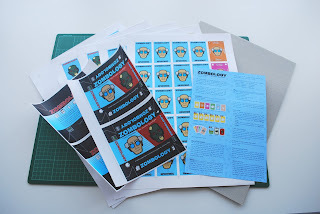 I was asked on Friday evening on twitter if I could share some of my ‘Hand-crafting secret sauce’ by a fellow game designer and Zombology customer. His question was specifically around three things: tools, costs and time. The tools question is pretty easy to answer as I did a post on this years ago, but I’m still using the same tools. The corner rounding tool has halved in price since I bought it in 2006, so it’s not quite so expensive any more. In terms of costs, Zombology is pretty straightforward. Shipping is the cost of the padded envelope (I bought them in bulk so they were only 30p each) plus Royal Mail 1st class postage to the UK (£3.40) or standard parcel elsewhere (£4.10 to Europe, £5.65 to Australia and New Zealand or £5.15 to everywhere else). For those copies I sell via my website PayPal fees vary between 67p and just over a pound. The cost of manufacture for Zombology comes down to printing alone. I bought box card (750 micron thick greyboard), box labels, rules sheet and card sheets from a local digital printer. Printing is one of those things where there are real economies of scale. The first copy is really expensive, but the more you do the cheaper it gets. I wanted to sell Zombology (which is 108 cards and a rules sheet in a two deck card box like No Thanks! or 6 Nimmt! comes in) for £10, which is more or less the retail price of a game that size in the UK. I also wanted to do it at a profit so that I had some money to pay for advertising, a website, trips to conventions, making prototypes of new games and to grow the company so I can make bigger print runs or more complex games in future. When I was pricing it up the cost for 100 copies was £585, so £5.85 per game. If I sold all 100 copies at full price (I’ve already given away four for reviews, my copy, etc. so that's not going to happen!) then I could make at most £415 minus PayPal fees. Which doesn’t leave a lot for all the other things I’ve mentioned above. 150 copies was £630 (£4.20 per copy) with an absolute maximum profit of £870, and 200 was £790 (£3.95 per copy minus PayPal fees) with a maximum profit of £1,210. Could I sell 200 copies? That’s the £790 question. Sales are on track at the moment, but without any marketing budget or any real marketing skills it’s hard work, especially with the constant stream of amazing looking Kickstarters with their stretch goals and hundreds of minis. We will have to wait and see. I could have made the game much cheaper than that, but I made a couple of decisions which push up the costs and the quality. It's squeezing my margins and forcing me to do larger runs, but it's a decision I still stand by. I craft games to a very high standard. I do it in my spare time around a young family, after the girls go to bed. And seeing as I’m usually up around 5am, I don’t go to bed late myself, so time is very limited. Decision one was to use vinyl stickers for the box labels. When I did Border Reivers and It’s Alive! I printed the box labels on paper and then hand glued them onto the box blanks using watered down PVA glue. It took ages and was really awkward. With less time available I’m all about saving time and effort where possible. The vinyl stickers are very expensive, but they are very quick and easy to stick on. Decision two was to keep laminating the cards and box labels. The printer applies a very thin coat of plastic over the artwork and then melts it into the paper. It makes the cards and box more hardwearing, slightly water resistant and it feels really nice in your hands. Again it’s totally worth it. I want people to be amazed that I’ve made the games by hand, not think they look and feel shoddy. The final question was about time. I make the games in batches of six (the number of boxes I get out of a single sheet of SRA2 greyboard. Each batch takes about four hours (it was 4.5, but I’ve honed it over the twelve batches I’ve made so far), so it’s about 40 mins per game. The boxes take about 15 minutes each including cutting out, folding, taping, cutting out the labels and then labelling. Folding the rules is about 2 minutes and then cutting out all 108 cards takes 20 mins. Rounding all the corners using the aforementioned tool takes the final three minutes! The Baby is sleeping particularly badly at the moment, a combination of teething x4 and a filthy cold. As a result The Wife and (to a lesser extent) I are also sleeping really badly too. To survive we're going to bed crazy early, which considering my Eurydice Games time is after the kids go to bed means I'm making little progress at the moment. I am making some though. The Father-in-law was up at the beginning of the week, and bless him he did a bunch of my chores, which freed up some time. 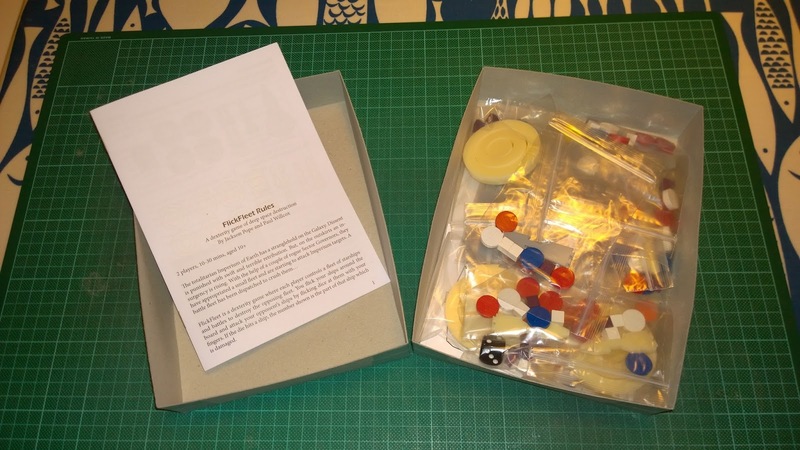 That meant that one evening I finished early enough to do some bagging of bits for the FlickFleet prototype, and then Thursday before Games Night I had a few minutes to cut out my ship dashboards and make a box. With the exception of the rule book (which is currently undergoing a revision), I have an up-to-date copy! That should make teaching it to people a bit easier - playing with out of date dashboards was very confusing. What are your thoughts? Obviously, the art is just placeholders at the moment, to get a feel for the composition. Feedback on twitter earlier in the week was it wasn't clear that the shadowy hand was flicking the beige ship - maybe extending the middle to little fingers would help. I'm investing a lot of time into FlickFleet at the moment. A couple of weeks ago it was preparing for the Cardboard Edison Award entry, and then getting Paul's prototype ready to hand over. I've decided to redo the rule book before sending out the remaining prototypes as the one I did for Cardboard Edison was pretty rushed. I think it was ok to learn the game from, but it needed more diagrams and some examples and that was too big a job to do before the submission deadline. I've been working a bit on that this week, and also starting to think about the design assets I need to publish it: box art, pretty rule book and a logo. Paul and I have also been thinking about another action for ships - the helm. It was in a very early cut of the game but disappeared when the ships began to move with flicking instead of templates. Adding it in again adds another hard decision to make and removes some of the frustration (but also the fun) of a bad flick ending up with a ship pointing in a crazy direction. I need to try it out this week to see if it improves things. This week's goal, after my father-in-law departs is to finish off and post the prototypes, which means finishing the rules upgrade first! This week just gone has been all about FlickFleet. At the beginning of the week I was trying to get everything in place for a Cardboard Edison Award submission. I needed a short intro (easy! ), a rulebook (needed a lot of work!) and a less than 5 minute video overview. 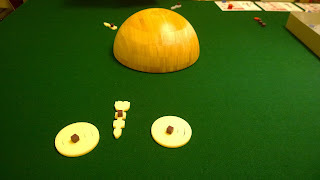 I revised the rulebook, adding a few more diagrams and three scenarios (only one of which I'd tested!) and then ran out of time. I think it's just about good enough to learn the game from, but it desperately needs another revision with more diagrams and some examples. The final piece of the puzzle was a video which my mate Wilka helped me with. As always when you see your hear yourself in recorded form it was excruciating. I've a face for radio and a voice for silent films. It's hard to imagine that someone could make a game as fun as FlickFleet sound more boring. Next time, I need to bring some energy, enthusiasm and personality. But, I submitted it anyway. I'm really hoping to get some decent feedback from the process. I'm one of 192 entrants, of which about ten will be chosen as finalists based on the overview, video and rulebook. Those finalists will have to submit a prototype at the end of the month. With the Award submission out of the way, the next focus is making some prototypes. I spent three of my lunch breaks last week on that: taking the second set of perspex (delivered to me and not random stranger in London) to give to my mate Dan for laser cutting; collecting a bag of pieces from Dan and then collecting the ship dashboards from the printers (my printer is still broken). I wanted to get at least one finished, before my mate Paul (the co-designer) arrived for the weekend with his family on Friday evening. I had to strip the plastic coatings off the ships, bag the ships and wooden bits, cut out the dashboards, make a box and finally fold and staple the rulebooks. I finished five minutes after they arrived! 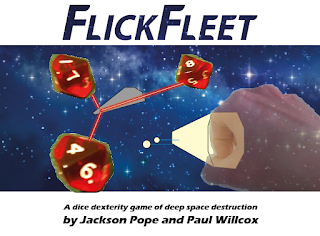 Paul had the original idea for FlickFleet back in the Summer of 2016 and has had several critical ideas during the development. Until now though the only copy in existence has been mine and I've been doing the lion's share of the playtesting and development. Now Paul finally has his own copy for testing with his friends, and it meant that we had a updated version to try out together over the weekend. We ended up playing all the scenarios (the two I hadn't tried yet twice each, and the other one once) and managed to work out a couple of kinks. The new jigsawed bombers worked much better and the scenarios were surprisingly together and fun considering I'd just thought them up one morning on the way to work and then typed them up. We also spent the day on Sunday with Paul coming up with scenario after scenario. I'm hoping to have four or five in the rulebook and then a bunch more on the website - for a long time this looked like it would be a bit of a stretch, now, not so much! This week I'm travelling for work again, but I'm also hoping to get some more prototypes done for sending out to some blind playtesters.